Historic Downtown Franklin, North Carolina, features 3 museums that showcase our heritage and all are within walking distance of each other. The Macon County Historical Museum, Franklin Gem & Mineral Museum, and Scottish Tartans Museum (the only museum of its kind in the world) each showcase a unique piece of Franklin's history and heritage. Hours vary and you can learn more by selecting the links above. Inside the city limits of Franklin you'll discover eateries, coffee shops, delis, and even breweries. 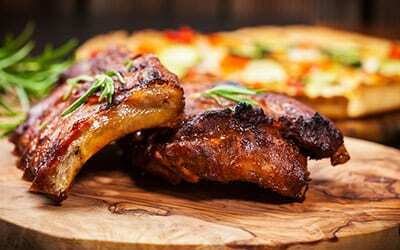 The variety of restaurants is exceptional offering everyting from homestyle cooking & BBQ to dishes with an international flare. Beverages from gourmet coffee to craft beer can be found. Plus food trailors have become part of the landscape of our downtown offering even more variety. The Town of Franklin offers a wide variety of places to eat to tempt your tastebuds. From a quick sandwich to fine dining, you'll find unique eateries that will have you wanting visit and fill-up again and again. Franklin also has some great coffee shops and bakeries and so much more. Franklin is surrounded by the Blue Ridge Mountains and tucked away you'll discover plenty to do in the great outdoors. Hiking trails including the famous Appalachian Trail & Bartram Trail line the landscape. There are abundant waterfalls in the area to see, as well other outdoor activities such as mountain biking and whitewater rafting. 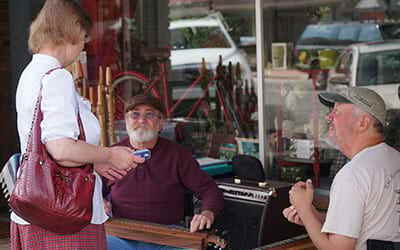 Franklin has long been known as the "Gem Capital of the World". In fact, you'll find many active mines where you can try your at hand a finding native sapphire & ruby. 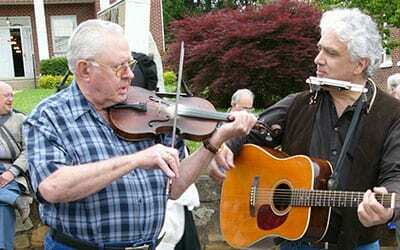 Pickin' on the Square is another favorite of visitors and locals alike. Enjoy live music Saturday nights in Downtown Franklin at the Gazebo on the Square from late May through late October.